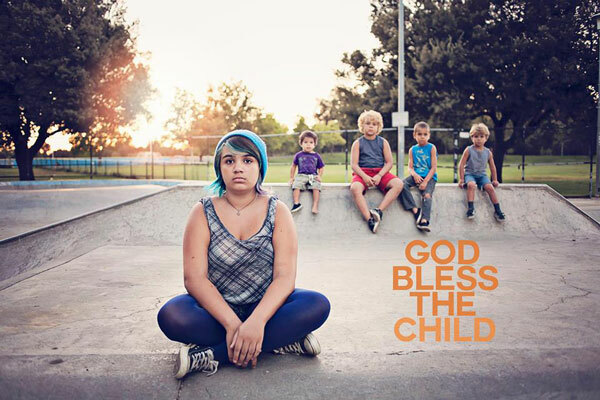 Directed by Robert Machoian and Rodrigo Ojeda-Beck, God Bless the Child, is about five siblings, from one to thirteen, who spend a day on their own, not knowing if their depressed mother has any plans to return home. The oldest (and only girl) of the group, Harper, looks after her brothers as their day becomes more and more chaotic. The film stars Machoian’s five children (Harper Graham, Elias Graham, Arri Graham, Ezra Graham, Jonah Graham) and two dogs (Rex and Buster) so the whole project was definitely a family affair. The two, who have been making films for the past five years, premiered God Bless the Child at SXSW and I got a chance to sit down and talk with them about the film, working with the kids and 2 patients dogs. Can you tell me about the film? Where did you guys get the idea from? Robert Machoian: My father was the oldest of five and he was kind of put in the position where he was constantly having to raise his siblings. And he told us a specific story that resonated with us and ended up being the kernel for this film. So it really kind of came out of that. Casting was probably the easiest thing in the world I think, right? Robert Machoian: Yeah well, the decision to cast my children was an easy decision. But then obviously knowing the difficulties of working with all five of them – the youngest was 1 1/2 at the time we started shooting. So then we wrote the script knowing who they’re going to be. We’ve done a couple films with kids but the more of them you bring into it the harder it is to manage. How long did it take you take to shoot? With kids, it had to be difficult. Rodrigo Ojeda-Beck: That was something we knew would be a challenge early on. You know, working with five children is never easy in general. What is the line? Never work with kids and animals? Robert Machoian: We had 2 dogs too. Rodrigo Ojeda-Beck: We we’re just setting ourselves up for a nightmare. We needed time. We needed a lot of time. Fortunately, Robert and I, the last couple of years that we’ve been making films together it’s really just the two of us on set. Usually one on camera, one on sound and we both direct. So, we knew if we work that way, we’d have a lot of time to make the film. So, we went in scheduling about three months of time and it probably took us about 3 ½ months to finish. Robert Machoian: We worked pretty consistently the whole time. We took weekends off, at least the kids did. I think it was more of the kids taking time off than we were. But they also have a limit and we knew that. That was one of the things we discussed. Working with five children and the pre-production, we may be able to shoot for four hours or we may be able shoot for 30 minutes. And that’s the unknown. But regardless, we needed to be open to that. Because with their performances and the things we wanted, we knew we could force it. Like if we just kept trying to push on them, they would just start going through their routines and that’s kind of a waste of time. And so had to be really protective that. Luckily, they shot on most about four hours a day they were willing to go. And then it was just a matter of when they were done. We needed to acknowledge it be done too. And we just shifted over to editing. Did you guys rehearsal anything before you shot? Rodrigo Ojeda-Beck: We would rehearse a little before shooting if it was a bigger scene that we knew had a lot of dialogue involved with it. So, sometimes more than others. I know Robert before set was definitely going over lines with them. They did a good job, surprisingly that wasn’t too hard. That’s the thing with kids you know, you don’t have to force them to go somewhere, they’ll naturally go there. They forget the cameras there. But then getting them to walk out the door would be seven takes. The walk in there and see like half of a waffle and they get interested. Hey, that’s me too. If I see half of a waffle, I’m going for it. Rodrigo Ojeda-Beck: Road blocks for all of society waffles are. Robert Machoian: Yeah, Rex the bigger dog in the film, he was actually in our other films well, I think he knows. We got him from the ASPCA and I know his history and I know he’s not a movie dog but it feels like it because he was really patient. There’s a great shot in the film where he’s just kind of standing there after the kids have given him a bath and he was just willing to sit and let me film it. And then Buster, we got him and he was only a couple months old when he started shooting. We knew we needed a second dog and we as a family needed a second dog, so it works for the film and for the family. He is right out of a cartoon though. The tiny dog that harasses the older dog. He was a little more trouble in trying to direct him. So, with the kids now, do you think there’s an acting bug? Robert Machoian: Oh yeah. They’ve already been pushing us to make another film. I don’t think the oldest child is Roberts, she don’t look like him and is too dark to be his. Presuming they never married since the kids all have their moms last name, Robert if I were you, I’d get a DNA test and that your girlfriend has some explaining to do.